Now, I never underestimate how a story can grow and shoot off in the most unexpected directions. The caption on the photograph says Whitelow Road and I was drawn to it by the men working on the road. 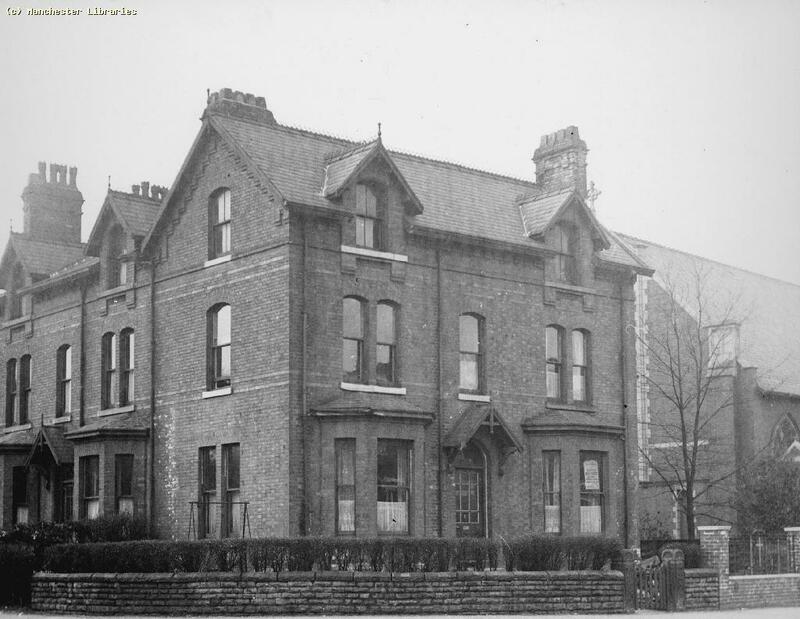 And that inspired my old friend Andy Robertson to delve deep in to Manchester’s Local History collection where he found another photograph of the same house. He sent it over adding that “I think I may have solved the mystery. I found m17923 taken in 1959 and the house looks identical. You will notice St John’s Church to the right, so this old house was demolished post 1959 and the land is now the church car park. On the old picture the house looks like it could be on a corner. If this is correct we have an exact location for our workmen”. And that led to a search for the inhabitants of our big house. In 1911 it was the Cobley’s who had been there from at least 1891 and were in oil with the four daughters of the widowed Mrs Caroline Cobley listed as Co-Partners in Oil Trust along with the son. In time I will go looking for the company on the maps of the period and see if they are listed in Company House and whether they appear in the local newspaper. For now it is enough to record that their house was indeed a big one with twelve rooms, matched by the one opposite which had fourteen rooms and is now the site of a block of flats.